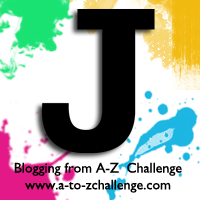 Today I’m continuing with the A-Z Blogging Challenge. This year I’m doing an A-Z of Colours. I’ll be doing a variety of posts, including haikus and poems, arts and crafts, fashion and beauty, recipes and more! For the letter ‘J’ I have chosen the colour Jet. This is the darkest shade of black, named after a mineraloid similar to coal (not a true gemstone as people sometimes think). This Pinterest board has some amazing jet black inspiration. Jet black symbolises power, strength and danger. It has long been associated with death, mourning, evil, witchcraft and superstition-probably because it is the colour of darkness and shadow. However, in fashion it’s associated with class, sophistication and sexiness (as in ‘a Little Black Dress’). It’s a colour that never goes out of style. Complementary colours: Goes with anything! Animals: Jaguar, panthers, Celebes Crested Macaque monkeys, beetles, many insects, Eastern grey squirrels, many dog and cat breeds, friesian horses, bears, bats, rats, Mexican black kingsnakes, scorpions, many birds (eg. ravens, crows, blackbirds). Foods: Licorice, blackberries, black lentils, black beans, oreo cookies, espresso, dark chocolate, wild canadian rice, black olives, black pudding, caviar, many types of mushroom. The mineraloid jet has been used to make decorative objects such as jewellery and ornaments since the Neolithic period. Jet is made from decaying wood under extreme pressure over millions of years. During Roman times, people saw it as a magical material and often used it to make amulets and pendants because it supposedly deflected the gaze of the evil eye and protected the bearer. The Victorians used it to make mourning jewellery because of its sombre colour and modest appearance, and jet beaded necklaces were fashionable in the 1920s. 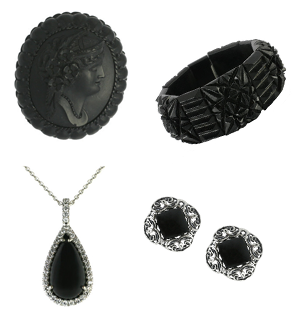 If you’d like to know more, Whitby Jet has some really interesting information. Do you like jet black? What do you think of the jewellery and carvings? I heard that wearing black diamond will keep you safe from people who practises dark magic. The jewellery is beautiful. I love black and white outfits, but I can't wear them myself because my old school uniform was black and white, so I immediately think of school. On other people, it's so stylish. The jewellery is beautiful. I love black and white outfits, but I can’t wear them myself because my old school uniform was black and white, so I immediately think of school. On other people, it’s so stylish.